Lionheart is prepping to embark on "The Built On Struggle Tour" to promote the new full length album coming out this November on Mediaskare Records. 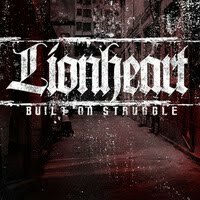 Lionheart with be joined by Donnybrook, Call to Preserve, and Stand United for a U.S. trek beginning on September 3rd and ending on October 11th. Band's new record "Built On Struggle" is by far the bands most innovating release to date. It also features guest spots by Karl Buechner (Earth Crisis), Lord Ezec AKA Danny Diablo (Icepick/Skarhead), Brandan Schieppati (Bleeding Through), Bruce LePage (orignal singer of 100 Demons), and a guest guitar solo by Dave Nassie (ex-Suicidal Tendencies).